Special thanks to Pages Megan Mercer (Pratt, KS) and Heather Kerschen (Cunningham, KS). 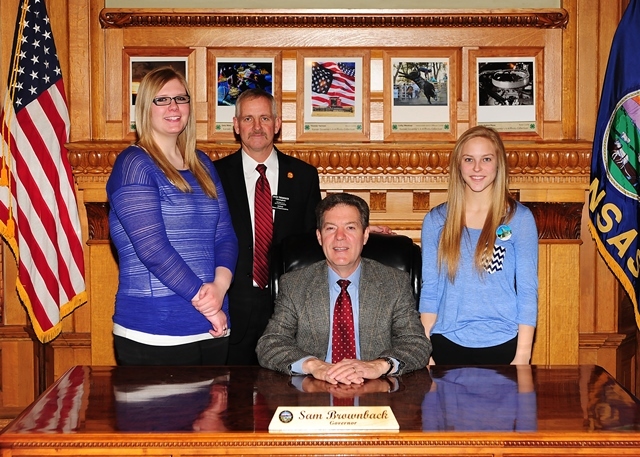 Megan and Heather are participants of the Legislative Page Program. The Page program is designed for students in middle school, junior high, and the first years of high school. The program provides an excellent opportunity for students to learn more about the legislative process. I encourage all students who would like the opportunity to serve as a page to contact me and submit your name as a candidate. the last day for non-exempt bills not in the house of origin to be considered. obtain a favorable contract and would give schools more flexibility to hire qualified teachers. items would be down from the 30 optionally negotiable items allowed under current law. The House passed HB 2326, as amended, on Thursday, February 5th, by a vote of 109-14. The House passed HB 2154 on Wednesday, February 25th by a vote of 121-0.
tuition and fee requirements will lose federal GI Bill funding approval. The House passed HB 2228 on Thursday, February 26th by a vote of 123-0. Democrat primary voters who voted for Mr. Taylor over the other primary candidate. filled by a candidate’s party, by law, be filled and reported to the secretary of state. The House adopted HB 2104 on Thursday, February 26th by a vote of 69-54.
was not being compromised for the benefit of savings. turnpike roads only as originally agreed to in 2013. The House adopted HB 2085 on Thursday, February 26th by a vote of 123-0.
two years in prison because of the severity level of aggravated battery while driving under the influence (DUI). faced longer prison time because of the DUI convictions he had previous to the aggravated battery while DUI. Mija’s family was on hand during the debate and passage of the bill. The House adopted HB 2115 on Thursday, February 26th by a vote of 123-0.